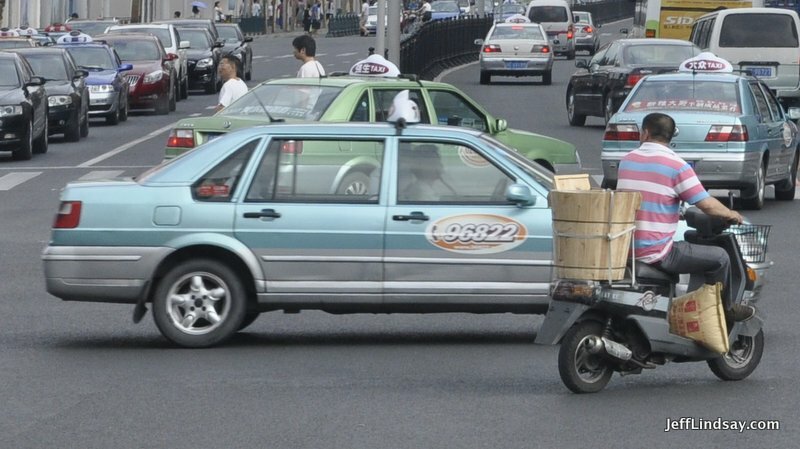 Though most of my cab rides in Shanghai turn out well, occasionally something goes sour. In the heat of the moment, it’s easy to make some serious mistakes, just like I did today. My cab ride had just begun when I pulled a beloved Chinese epic sci-fi novel from my bag to begin some precious reading time. Suddenly the cabbie saw something come in on his cell phone and turned around and told me that he was sorry, but I had to get out so he could go get another customer. Had I been better prepared, I would have said no, I’m your customer, and please take me to my destination. This might not work and sometimes could lead to a big argument or even physical fight, but I should have resisted or at least have him take me a little closer to my destination or to the nearest subway or something better than what I did, which was 1) give up easy and 2) make a dangerous and actually illegal exit in the middle of an intersection. “Rats,” I thought, when he told me to get out. I resigned myself to his rejection, but was actually too cooperative. He was in the left lane at an intersection at a red light. There were just seconds before it would be green, so I needed to hustle. It wasn’t a busy intersection, but still, it was wrong to let him force me out there. As I hastily prepared to open the right door, I was focused on traffic coming along the right side of the car, not wanting to be hit by a motorcycle or other vehicle. This was stupid and dangerous, for I at least should have insisted that he first drive me to a safe spot. I got out safely and he drove off. Only later would I realize that he had my beloved book, with many markings and notes, sitting unloved in the back of his car. I was only 75 pages into it, but it was a painful loss, and I had no way to reach him because he didn’t charge me for the brief ride, meaning I didn’t get a receipt. Rule #1 of cab rides is NEVER GET OUT WITHOUT A RECEIPT. The main reason for this is in case you leave something behind, you can use the receipt to call the company and identify the driver and get your goods back in most cases. (It also is essential if you get double billed if you got the cab through WeChat, paid by cash, but then also got an automated WeChat bill.) But a corollary to that rule is if you are being booted out without a receipt, get a photo of the driver’s ID posted in the front of the cab and a photo of his license plate number in case you need that info later, either to recover lost goods or, as in this case, to also report illegal dumping. And you might as well ask for an old spare receipt (fapiao) as partial compensation for your lost time–they usually have several. Of course, if you have your wits about you enough to get the ID and license plate, you will also be thinking about not losing goods and looking carefully before you step out of the car. But this requires being smart enough to step out of the car in a safe spot where you can take the time to slowly gather your things, check the seat carefully, and gracefully exit instead of just making a made dash to get out of an intersection while someone drives off with your book (or cell phone, wallet, passport, etc.). Know that this is illegal and try to insist on your rights. If he won’t respect your request, take your time. Ask for an explanation. Repeat your request. Don’t feel obligated to jump out right away. No need to reward his bad behavior. But stay friendly and don’t provoke a fight. Take a photo of his ID (this will alert him that you have the power to report him, and that may change his tune on the spot). Ask for a spare fapiao as well. Make sure you have the phone number of his company. When you get out, also get a photo of the license plate and maybe of him as well (leaving a door open for a while can buy you time for this so he doesn’t speed off immediately). Take your time to gather your stuff. Don’t leave things behind! Always ask yourself: is there anything in the trunk? On the floor? Anything that could have slipped from my pockets? Never get out at an unsafe and inconvenient location. If he won’t take you to your destination, insist that he drive you forward to the next subway station or at least to an area where it might be easier to catch a cab, and make sure he takes you to a safe spot to exit. By knowing your rights and being assertive/annoying in a calm, friendly way, you may help him realize that cabbie crime doesn’t pay, maybe making things easier for the next customer. But don’t provoke him into extreme anger. Some cabbies have assaulted passengers, so be careful. You can just roll over like I did — but don’t do it in a rush, for you are more likely to lose things and have an accident. Take your time and insist on safety. For me, the loss is mostly recoverable, for I just ordered a new copy of the book on Amazon.cn, and will have it back in my hands tomorrow. Taxi losses can be much more painful than that, so be careful and keep your wits about you. Many foreigners visiting of living in Shanghai have learned about the Maglev, the rapid train that connects the PuDong International Airport with a location closer to the center of Pudong. The 50-RBM ride (40 RMB if you use a metro card) from the airport to the Maglev’s other end at Longyang Station takes only about 8 minutes reaching a brisk speed of 300 km/hr, whereas it would take about 40 or so minutes on the metro (Line 2) and would take over 30 minutes by taxi, depending on traffic, and would cost over 100 RMB. So a great way to get to downtown Shanghai is to take the Maglev to Longyang Station, and then take line 2 or line 7 from Longyang to get to other parts of Shanghai. If you are brave and perhaps foolhardy, you can take a cab from Longyang. In my experience, it’s the worse place in town to take a cab. The problem is not that cabs are hard to get–there are a lot of them anxiously waiting for foreigners. The problem is that it’s hard to find honest cabs, the ones that use the meter and charge you fairly. Cabs almost everywhere else in town can be expected to use the meter and comply with the law, but not at Longyang. You tell them where you want to go and then they act like illegal black cabs, telling you the price they will charge without using a meter. A ride that normally would be 35 RMB, for example, will be quoted at 100 RMB, and almost always at least twice what the real rate ought to be. And you probably won’t get a receipt for the ride, either. The taxi is a “black cab” for that ride. It’s illegal, but they do it at Longyang as their standard operating procedure, mainly to prey upon gullible tourists getting off the Maglev. Do not get into a cab that isn’t going to use the meter. If you can’t speak Chinese, say “meter” and point to it and make sure they will use it. If it’s not on when you get in, stop and get out. I think “dabiao” is the Chinese way to indicate the ride will use the meter. You can find cabs willing to use the meter there, though you may have to walk past the line of snakes waiting to prey upon you and go beyond the taxi stand area out toward the main street and wave one down there. Don’t encourage the snakes to keep preying on foreigners by giving in and paying double to triple fare to a cabbie in a normal cab illegally acting as a black cab. Better to take an unmarked black cab than a marked cab where the cabbie has dishonestly turned off the meter. When you let a dishonest person take you for a ride, it can turn out poorly in several ways. The excessive 100 RMB fare he quoted you might become 100 RMB per person. You might get taken to the wrong place. Why take further risk? Don’t be in a rush. Plan on taking at least 10 extra minutes to find an honest cab, or take the subway instead of the Maglev, if only to get to a new location where the cabbies are more honest. 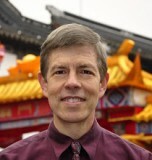 Jeff Lindsay lives in Shanghai but has roots in Utah and Wisconsin. His interests include China and Chinese (the language and the food), intellectual property, chemical engineering, magic (a hobby), reading, writing, travel, photography, and his LDS faith. This website has been around since 1994 and has a troubling mix of topics and styles. Therapy hasn't helped, but maybe you can. Chime in and let me know what you think. Jeff writes occasionally at Innovation Fatigue, Nauvoo Times (Orson Scott Card's project), Mormanity, and here on my "mixed report" blog, "Shake Well Before Serving," now mostly about China. The website and all relevant rights, including copyright and all other rights to my creative works and distinctive marks such as Mormanity®, a registered US trademark, are property of Planet Lindsay, LLC, a Wisconsin LLC of which I am president and owner. Please don’t use my content or marks without permission. The Hmong People in Wisconsin: Immigrants from Laos to the U.S.
Isis and Maat in Facsimile 3 of the Book of Abraham: A Horrific Blunder by Joseph Smith? Walt Whitman as the Source for Lehi’s Dream and More?